The status menu is Power Manager's main method of showing you pending events, performing events, and providing quick access to on-demand events. 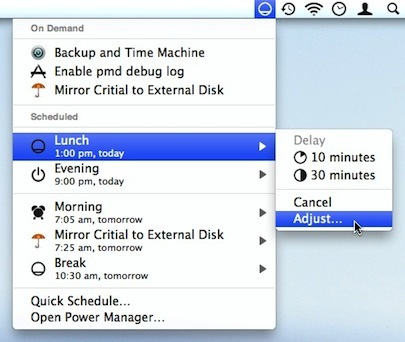 Power Manager 4 introduces a new status menu bar. The status menu has been given a new look and feel, with larger artwork and a new structured layout. Thanks to improvements in Power Manager's architecture, the status menu now offers more and does more than ever before. 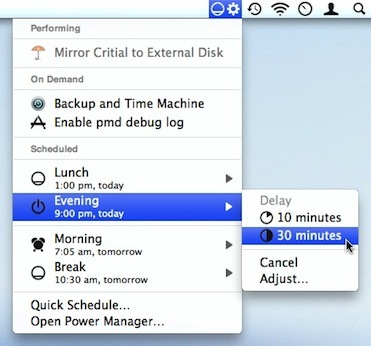 Power Manager 4 introduced support for on-demand events. These are events that can be triggered immediately. The new on-demand behaviour is great for creating events that back-up or perform scripts. In a couple of clicks, you can trigger the event without leaving your current application. I have an event called "Backup and Time Machine". This event performs two actions: the first begins a Time Machine back up, and the second launches Apple's Backup software. This single event allows me to immediately and easily back up my work to two separate places, one local and one remote. On-demand events are displayed at the top of the Power Manager status menu. These events are grouped under the appropriate title. To trigger an on-demand event, select the event from the status menu's "On Demand" section. When an event is performing, or its criterion are being evaluated, the event appears in a new section of the status menu. The status menu bar's icon changes to include a small cog; the appearance of the cog lets you know Power Manager is working away. The status menu's icon changes depending on your schedule. This is a small touch but it provides useful and timely advice. A quick glance at the icon will show you the next pending event's icon, and if the icon is dimmed you know that event is at least an hour away. The status menu's icon is dim (light gray) when the next event is more than an hour away. The status menu's icon becomes vivid when the next event is due within the hour. You can additionally hover over the status menu to see a brief summary of the next event. This article was posted in Guide, PM4, and Power Manager and tagged dssw, Power Manager, and status menu.